A cost effective, general purpose acetic cure formulation offering long term durability in a range of general sealing and general glazing applications. lt fits many requirements of commercial and industrial applications, especially where a consistent source of materials are preferred. 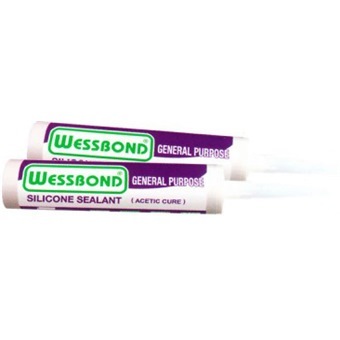 Wessbond Acetic Silicone Sealant offers outstanding adhesion to glass, aluminium, ceramics, fiberglass, non-oily wood as well as painted and many plastic surfaces. lt is also well suited for general sealing applications such as window sealing and glass construction, industrial sealing such as ship building, containers, caravans, car-body and cold room construction.